Oh, what an exciting two weeks we have had! 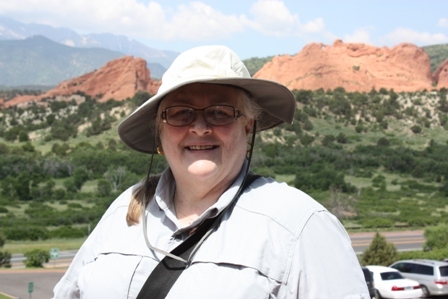 The Husband and I drove to Denver, where we went to the Historical Novel Society international conference. This was the first of these conferences we had attended, and this one was special. 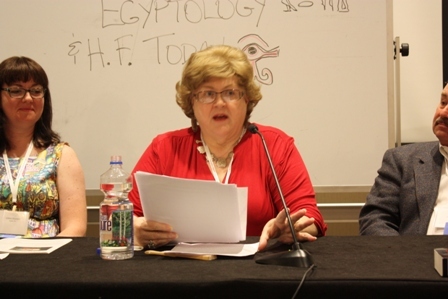 On Saturday, June 27 I was privileged to be part of a panel on Egyptology and Elizabeth Peters. This was especially exciting, as Barbara (Mertz, Elizabeth Peters’ real name) had been a friend. 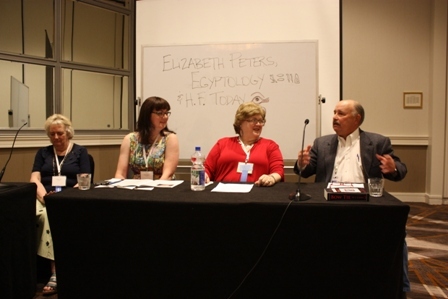 Fellow panel members Bill Cherf, Libbie Hawker, Lindsey Davis and I each talked about a different facet – Bill about her early life and schooling, I about her life as a writer, Libbie about how her Amelia Peabody series had affected Egyptian-set fiction, and Lindsey about researching a novel in Egypt. It went smoothly and was very well received. What did not go well was the booksigning. There were many, many of us and a stuffed-full bookstore, but the only interest among the book-buyers was for Diana Gabaldon. She had been set up quite a ways away from where the rest of us were; people came in, got her to sign their book and then left, most without even glancing toward the other authors. The most books I heard of any of us selling was four; that caused a lot of bad feelings, and some authors were quite outspoken about their feelings regarding a woman who has sold a bazillion books syphoning off all the attention from everyone else. I can’t say I blame them. The whole thing was badly managed. 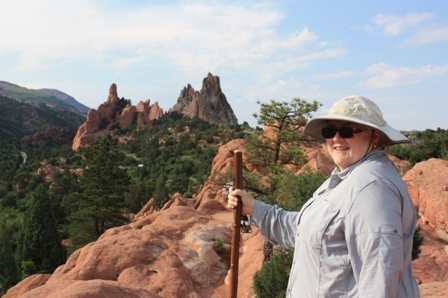 After the conference ended, The Husband and I stole away from Denver to Colorado Springs, where we had a room waiting at the Air Force Academy, and for the next two days did the tourist thing. 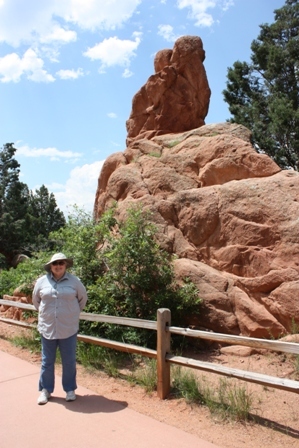 On Monday we planned to spend half a day at the Garden of the Gods, a fantastic place of spectacular rock formations that will take your breath away. We were still there at six-thirty in the evening. Yes, that’s me in the pictures – look kind of different from when my hair is fixed and my jewelry on for the seminar and signing, huh? The next day we drove to Cripple Creek and took the Mollie Kathleen Gold Mine tour. You get in this tiny little wire elevator – there were five of us in it and it was as full as it could be – and go down 1,000 feet into the earth. Not my favorite idea of something to do, but not as bad as I feared. The mine tour was fascinating, and we had a lovely guide who has agreed to help me with research and facts on a novel. Yes, I got a simply splendid idea for a 1910 Western Gothic while down in the mine… I can’t go anywhere without getting at least a couple of ideas. Sigh. So many ideas, so little time! After the mine tour was over we had lunch in a lovely little café, then walked across the street to a charity shop, where I saw the most fantastic Victorian candlesticks and rose bowl in beautiful acid-green vaseline glass. Now we do not need any more stuff, but I had never seen anything like them, not even during the days I owned an antique shop. Of course I couldn’t leave without them, so after some dickering and a quick run to an ATM, I proudly tucked them into the back of the car. On the way back to Colorado Springs we stopped in a little town named Wood-something (I am terrible on names) at the dinosaur museum. It was fantastic! They actually had ancient bones you could touch, and so many fossil skeletons that some were hanging from the ceiling. There were film presentations and of course a gift shop, but the sheer number and variety of dinosaurs was overwhelming. We could have spent a whole day there, and plan to on our next trip to Colorado. The next morning we started home, and now real life has taken over. I have books to write. The Husband has to go back to work. But – we’ll never forget our stolen holiday in Colorado. Hope everyone had a spectacular 4th of July!